This is one plant that I cannot grow in my house. I can only have it in my office because my house is far too cool for this tropical beauty. You may wonder why I don’t grow it in one of my south windows–that would be too much sun for it–at least at my house. It also wouldn’t really be warm enough, even there because the big bay windows get very cool in the evening when the glass gets cold. But oddly enough the plant is very happy in my bright office at work, behind my computer which throws off a good amount of heat. So it’s a perfect office plant–for my office situation. 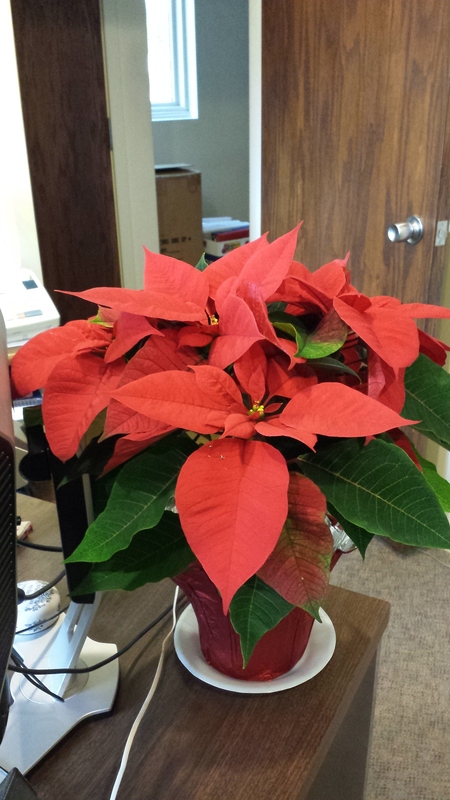 But what about poinsettias in general? What conditions do they need? Keep them warm–these plants are native to Mexico. That means if you are buying them in a cold weather region, make sure the store wraps them for you or bag them yourself. And don’t, for any reason, run a bunch of errands with these plants in the car. You’ll wonder why they “mysteriously” die on you a few days later. These are plants in the euphorbia family so they want to be kept “evenly moist”–think begonia care. Don’t let them dry out completely and do not, under any circumstances, over-water! (i). Cut them back. You can do this as soon as you are sick of looking at those brightly colored bracts. (ii) In March, begin feeding. I only use organics. You can use whatever fertilizer you prefer. (iii) By September, get them to an unused room where you do not turn lights on in the evening. I have a guest room that I use. I don’t obsess about this. If I need to go in once in a while I will put on the light. (iv) By early December, you should see the bracts beginning to turn color again. They will not be as full and lush as the “store-bought” ones, but you will have the joy of knowing you made your own poinsettia bloom!